For those of you who have been considering a BMW X1 or Buick Encore but don't think either are Audi enough, there is now a solution. This is the 2015 Audi Q3, the facelifted and truckier version of the crossover that's been on sale elsewhere in the world since 2011. Audi will show off the Q3 destined for North America at the Detroit Auto Show next week, but these are the first official shots of it. The company says it's "a premium, compact SUV that pairs coupe-like looks with the utility of a SUV." We say it looks a lot like a Q5, but that's only bad if you're trying to find your car in a crowded Williams Sonoma parking lot. 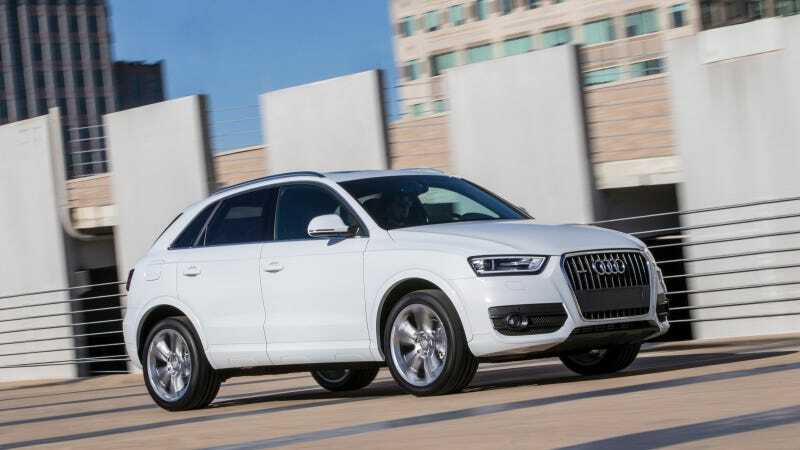 The Q3 for the U.S. will launch with a 2.0-liter turbo four making 200 horsepower and with standard front-wheel drive or available all-wheel drive, all routed through a six-speed auto. Standard features will include a panoramic moonroof, xenon lights, leather seats that are heated and powered up front and 18-inch wheels. Expect it to cost much more than the Buick, but probably less than the BMW. And expect to see it everywhere shortly after it goes on sale this fall.